Notes and Nerds: The AtariBox: What is the Best Route? The AtariBox: What is the Best Route? Nothing is currently known about the recently "announced" AtariBox. So little is known, we haven't even seen what the console looks like. We aren't even sure if AtariBox is the actual name of it. Regardless of what we know, here is what we think Atari needs to do. That teaser video right there is ALL we know about the AtariBox. It has a fancy, polished wood grain to it. It supposedly has the stylized grill on the top. It may have a light up logo. What we know for a fact is it is being built around modern PC hardware. However, even that is not exactly helpful. Are we talking about Intel, AMD, ARM, or some other processor? What about memory, storage, controls, etc. All of this is up in the air. Regardless of this, Atari should focus on what it used to do best. Make games. Everyone is up in arms about making sure their newest console is the center of the home. Streaming video, music, etc...they all think it should be on there, and we as consumers think a console is incomplete if it isn't there either. Well, YOU ARE ALL WRONG! A video gaming console should do one thing...play video games. You want to watch YouTube? Use a PC, phone/tablet, or your streaming media device from Roku, Apple, or Google. Atari needs to put their focus into the system playing video games, and keep it simple like that. Now that that is clear...what kind of games? Atari needs to get into good relations with the companies that now owns the classic Atari IP's. Midway owned a lot of them at one point, but when they went belly up, they were dispersed. 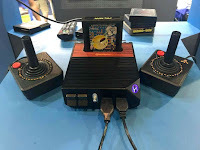 The Atari we came to know in the last decade and a half (Infogrames) only owned a small handful of IPs, and even those have dwindled recently. Atari really needs to get into good favor with the companies that own the IPs, and get a deal of exclusivity with them. Those games need come back to the Atari console as exclusive titles. On top of that, get some compilation titles with the arcade renditions of those IPs. Next up backwards compatibility. AtGames, and Hyperkin will be going head to head with the Atari flashback and Retron 77. However, Atari needs to bring the reigns in and take control over their brand. Make a "Retron" style system with cartridge ports for Atari 2600/7800, 5200, and Jaguar on the unit. Yes, it will have to be emulated software to handle these systems, but if the system is "PC based" already...so be it. I know a few of you are wondering about the controller, well easy! Go with a design that screams classic, yet feels modern. Think something on the lines seen in the Playstation and Xbox line of controllers. On that line, when it comes to the need of the 12 button keypad for 5200/Jaguar games...a simple keypad that snaps in at the bottom of the controller. Similar in concept to the keyboard attachment for the Xbox 360, and Xbox One controllers. What medium should Atari consider using if they are going to go for new games? First off, get an online store for digital content...including a "virtual console" style section. However, don't shun away physical mediums. DVD, or BluRay. Either one. This allows the console to grow its library with modern additions to their IPs...new and old. If I have to venture an expectation on console design...keep it vintage. If the teaser has any indication towards the direction Atari is going...keep on that path! Now, one last thing. A concern. This big teaser release, along with Hyperkin showing off the Retron 77 at E3. Is it coincidence? I hope that is all it is. I seriously am hoping that the "AtariBox" isn't a Retron 77 relabeling.